Moultrie is quite known for producing a high-quality game camera for hunters over the years. It is one of the best-selling brands not because of its popularity amongst hunters but the high quality of products that they are generating. 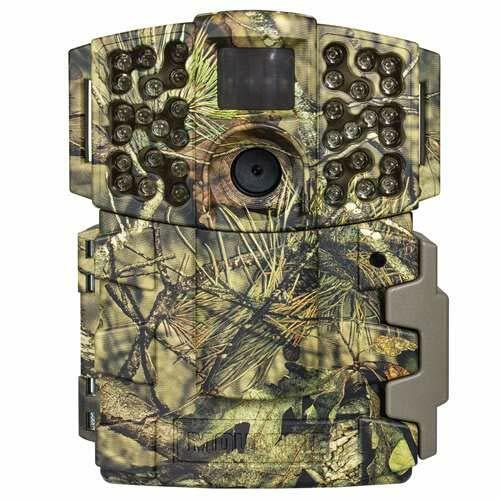 This Moultrie M-999i Mini Game Camera is in the very best taste for hunters who are looking for high-quality and reliable game cameras in the field. The fast trigger speed, flash range, flash technology, and quality of the pictures that it generates proves to be worthy of an investment. It captures both colorful daytime pictures and bright monochrome night time photos. You can also achieve dynamic videos of wild animals in modifying the settings correctly. The game camera features the invisible flash technology that will help in making sure that animals are not startled when the picture is being taken along with its quick trigger speed that is under 0.5 seconds. It will immediately capture any moving object that is within the tight range. And lucky for you if that moving subject happens to be a rare bear or deer roaming around in the forest looking for food or attacking its prey. The 20-megapixel sensor also generates clear daytime photos and clear monochrome pictures. You can get high-quality pictures of wildlife. It is ideal for deer hunting because you get to stalk your prey without your presence in the forest. Full HD videos with high audio quality. It features multi-shot modes and other useful options in the settings to let you modify the video the way you wanted it to be. This game camera also features the motion freeze technology. Other game cameras will frustrate you with blurry images of rare wild animals but rest assured that in this game camera, you can capture a running coyote or deer in action because of the technology. The 2-inch TFT color screen will allow you to preview images while you are in the field. So if you are going to check for photos and videos that you’ve got, you can quickly browse it without pulling the SD card and insert it into your laptop. The screen will also help you in finding the best position for your camera to capture great photos. The 36 black LED lights will help you in capturing bright monochrome pictures of deer, rabbits, coyotes, and even bears roaming around the forest at night. The following options such as time lapse, multi-shot, motion-detect delay will allow you to go along with the season and capture the perfect picture of the animal that you are stalking. It also provides useful information such as time, date, temperature, moon phase, and even camera ID to make it easier for you in hunting and analyzing the behavior of the animal that you are stalking. It’s all included in the image grab that you’ve got so that you will know the best time to hunt deer or whatever animal that you are planning to attack in the forest. If you are planning to set it up on a tripod, you can easily do it using the ¼ 20 mm bottom mount that will help you to have a more versatile arrangement. This game camera is also compatible with Moultrie mobile so that you can connect wirelessly to your game camera. You can easily monitor the forest or your house using the device anytime and anywhere. It’s a great way of scouting the area without ever having to leave your house. Its durability is something that is worth investing. An extra-toughed Mossy Oak Break-Up Country camouflage case protects the delicate imaging components of the camera. Therefore, even if you expose it to extreme sunlight and heavy rains, you can rest assured that your game camera will still be in good condition after a couple of weeks in the woods. One good thing about this game camera is that you can have up to 15,000 images before you drain the set of batteries installed. With that being said, you can leave the game camera in the forest to capture pictures and videos for a couple of weeks before you go back to retrieve the SD card and replace the batteries as well. One of the disadvantages of this game camera is that the location of the SD port is in the very back of the camera, giving you a hard time to get it out. Therefore, you cannot easily pull off the SD card while you are in the field. You may need to unclasp the game camera from wherever you have placed it and carefully pull the SD card out. Despite all the great features that it offers, the zoom feature is not available. This game camera is not recommended in fields in time-lapse mode considering the lack of the feature. This game camera is a great investment for hunters. Considering the features and benefits that it can offer, the price of this camera is reasonable and affordable as well. If you are looking for a trail camera that you can use for scouting, or if you are planning to have a trail camera instead of CCTV security cameras in your house, you’ve finally found what you are looking.